For the next selection of the highlife turntable I have selected the track Ubulu Jaja by Danny K and his young stars of nigeria. One could argue the modern sound for Ndokwa music may have started in the early 70's with the work done by Charles Iwebgue and then King Ubulu. Once these 2 giants had passed the sound was carried on by people like Rogana Ottah. This song appears to be a praise song dedicated to King Ubulu. In 1969, Danny K joined Chief King Kenitone where he served as a member of the band in Warri where he stayed for 5 years. King Kenitone and the band left Warri for benin City in 1974. They stayed in Benin City for three years up to 1977. King Kenitone left Benin-City with the band members in 1977 for Lagos where he stayed for 3 years until 1980. Danny-K left the band and Lagos for ghana and there he joined another band The Black Sentyergos Dance Band. He stayed until 1982. He then returned to Nigeria and joined another band led by Muchacha ( they might be referring to Muchacha Imuzor). He stayed till 1983. In the year 1984, he joined the Original Brothers Dance band. He stayed there for 1 year. In 1985, Danny-K played his first LP entitled Ogembiako - Uwam. The LP was backed by the Harmony Kings International Dance Band (possibly led by Franco Lee Ezute). In 1986, he then joined another band led by Rogana Ottah. In 1987 he recorded his second LP entitled Ebele Uma Uwa. It was backed by Rogana and his dance band. 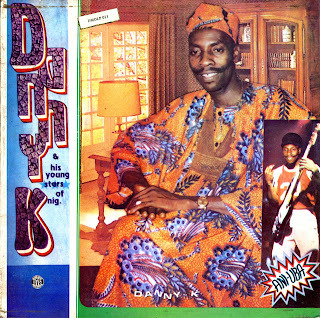 Danny-K then joined Ubulu International Dance Band of Nigeria where he played until the end of 1987 before he formed his own band. The song itself has some decent parts. The phrasing of the vocals are certainly reminiscent of King Ubulu and you can hear the influences of Rogana Ottah and Franco Lee in the guitar playing. This coupled with a super tight conga and drum back beat make it a good example of what well played ndokwa highlife sounded in the mid to late 80's. The song is also the one where I found my online african name: ubulujaja. I think I chose this monikor because this style of music was a gateway for me to serious african music and using the name helps me remember where the journey really started.